I’m excited to meet new classes this week, but even as they get underway, I can’t help but look ahead to Spring 2020 and a new course I’ll be teaching with Political Science professor Chris Moore: HIS/POS252L History and Politics of Sports. As I explained last week at my own blog, I’ve wanted to create a baseball history course almost as long as I’ve been at Bethel. But while HIS252L will surely have a lot to say about my favorite sport, I’m glad that we’ve instead developed a course with a wider focus… and that I’ll be sharing it with Chris, a specialist in international relations who won the 2018 Bethel faculty excellence award for teaching. We’re not just fans ourselves, but scholars who think that studying sports can help our students ask fundamental questions about community, identity, purpose, and justice, by taking a different perspective on American and international history. As you can see in the draft syllabus above, we’ve divided the course along the lines of a football or basketball game. After a warm-up week in which we’ll think about why we follow or play sports and how we approach the topic as scholars, we’ll survey the history of a few specific sports, then conclude our first half with deeper dives into topics like race, gender, labor, and business. Halftime will let us pause to consider various Christian perspectives on sports, then the third quarter will take us into the realm of international relations (with a focus on the Olympic Games). After the fourth quarter looks at emerging topics like e-sports and performance enhancement, we’ll conclude with a field trip to Target Field or Target Center, with students researching a “day in the life” of the Twins or Lynx franchises. 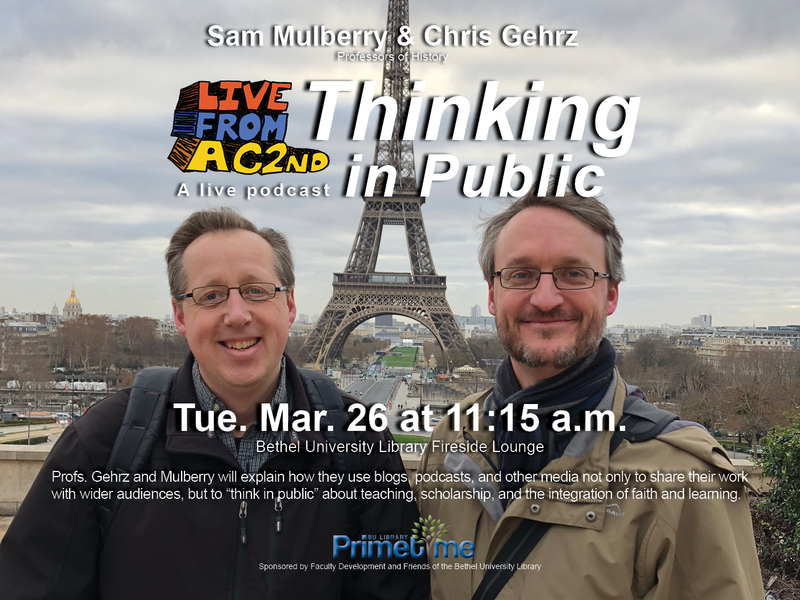 To help Chris and me think through the course before we teach it, our colleague Sam Mulberry is joining us this semester for a new weekly podcast, The 252. Last week’s debut previewed the Super Bowl and looked back at the history of the NFL. In today’s episode, we turned the focus on ourselves: why we play and follow sports, and what we love about them. Next week we’ll be joined by our first guest: Dr. Art Remillard of Saint Francis University, an expert on religion and sports. For about six years now, we’ve tried to use social media to better connect with past, present, and future Bethel history students. While it seems like this blog and our accounts at Facebook, Twitter, and LinkedIn serve alumni well, we’re always looking for better ways to reach out to current and prospective students. So last week we launched a Bethel History account at Instagram, the fast-growing photo-sharing site that is especially popular with young adults. While we’ll keep publishing interviews and other posts about career paths, study abroad and internship options, and department news and events, our Instagram feed will feature much less text. In keeping with one of the key themes of our new Digital Humanities program, we want to do a better job of telling stories visually. History kickoff bonfire. It’s going to be a good year. You can follow us on Instagram @bethel_history. Author Chris GehrzPosted on September 18, 2018 Categories Blogs, Websites & Podcasts, Digital Humanities, News & AnnouncementsLeave a comment on We’re on Instagram! This blog generally stays pretty quiet during the summer, as our students and faculty scatter and busy themselves with summer research, work, and travel. But our own Prof. Chris Gehrz maintains his usual blogging schedule at The Pietist Schoolman, posting three or four times a week on “Christianity, history, education, and how they intersect.” (Yesterday marked the fifth birthday of that blog.) Now, you can also read Chris once a week at a much more prominent site. Starting last week, he joined The Anxious Bench, a group blog on the Patheos Evangelical channel where “historians of broadly evangelical faith share their reflections on contemporary faith, politics and culture in the light of American and global religious history.” The Bench also includes Philip Jenkins (author of The Great and Holy War, among many other books), John Turner (The Mormon Jesus), David Swartz (Moral Minority), and Beth Allison Barr (The Pastoral Care of Women in Late Medieval England). Taking the spot of Baylor historian Thomas Kidd, Chris will both administer The Anxious Bench and write posts every Tuesday morning. Today he shared the story of a former Bethel dean whose Baptist principles led him to oppose school prayer in the 1960s. Last week he debuted with a post on British Christian responses to the “Brexit” debate and a call for Christians to love their LGBT neighbors by learning their history. Join Us for Homecoming 2015! One hundred years after it happened, how do we remember a war that killed over fifteen million people, unleashed the first modern genocide, and caused multiple political revolutions? To help us think about the commemoration of World War I – and why it’s especially challenging for Christians – Professor of History Chris Gehrz will draw on his experiences taking Bethel students to Europe, where they visit the former battlefields of the Western Front as well as sites in London, Paris, and Munich. That talk will be at 2pm in BC 468 Benson Great Hall. • Then on Saturday morning, Oct. 10th, History will partner with Political Science and Philosophy to host an open house for students and alumni in AC 228 (10:00-11:00am). In addition to catching up with friends and faculty (current and retired), you can check out early versions of Senior Sem research by Political Science students, and we’ll have a couple of computers available for people who want to explore Bethel at War, 1914-2014, the digital history project by Prof. Gehrz and History alum Fletcher Warren ’15 that will officially debut for Homecoming. Author Chris GehrzPosted on September 22, 2015 September 26, 2015 Categories Blogs, Websites & Podcasts, Courses, Digital Humanities, Events, News & Announcements, World War ILeave a comment on Join Us for Homecoming 2015! History is dynamic, and you should be a bright, capable, and thorough thinker, writer, communicator, and researcher because of your time as an undergraduate. The problem is that no one will know it until you tell them! People make assumptions about various majors all the time, and in the news they often recite and rehash false stories about college education that go unchallenged. On your resume, in your cover letter, and during interviews and networking scenarios you need to quantify your experience in terms employers can understand and change the common perceptions out there. Your ability to do this can make all the difference. Conduct a career poll: Ask four friends or relatives for five careers they can “see” you in. Then ask why they considered that occupation. Write down your initial reaction to the suggestions. Take stock of your greatest strengths. What are you good at? What value does that have to others? It concludes by recommending that you also set up a LinkedIn account and make connections with alumni who majored in History. To ease that step, be sure to join our own student/alumni group on LinkedIn! And, of course, be sure to visit Bethel’s own Office of Career Development and Calling, open to students and alumni alike. I would say producing a digital history site is more (or perhaps just different) work than writing a traditional research paper. With digital history, not only do you have to do all the research, but you also have to use technology to incorporate it in a visually appealing and cohesive way. Even the way you research for digital history is different. For a more traditional paper, primary sources are important, but secondary sources often become central. In contrast, digital history research is predominantly focused on finding and incorporating a variety of primary sources with secondary sources being supplementary. The most exciting part about it for me was putting the primary sources together using the Scalar platform. By integrating the primary sources with technology, I saw the history come to life. The most challenging part was learning how to format the information in a visually appealing way. It took hours of reading user’s manuals, tweaking, deleting, redoing, and improvising in order to arrange the information cohesively.